For the “The Baby’s crying and we have roughly 23 seconds before total meltdown!” summary here. There is a “specialty” formula out there for every common baby ailment from crying to fussiness, gas, reflux and spit up. In general, there is not sufficient research to back up any of these claims. Remember that the only good research supporting a baby formula helping an infant condition is for pre/probiotics preventing or helping dermatitis, and for hydrolysate (or partially hydrolyzed) baby formula helping prevent allergy. Otherwise, there is no magic formula that will cure colic or eliminate gas… no matter how much we hope so. However, some baby formulas may be tolerated better than others and thus make your baby more comfortable. 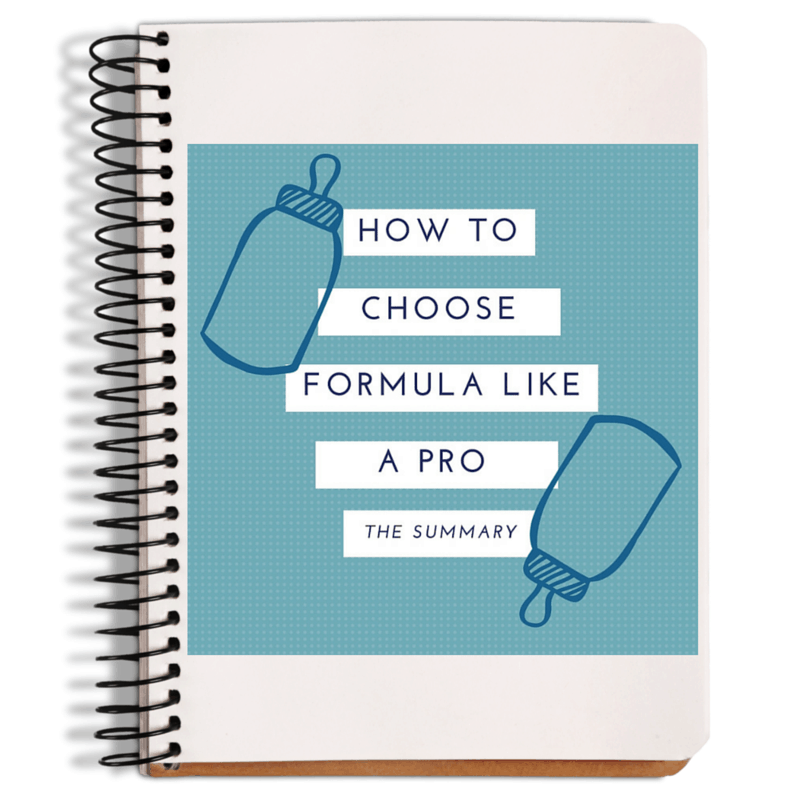 I want parents to understand what they are getting when they buy a formula that makes such a claim, so that they feel confident knowing WHY their baby does better on a given formula. Baby formulas marketed to reduce spit up and/or reflux usually have an extra thickener added. This simply makes the formula harder for baby to get all the way back up the esophagus. The most common thickener used is rice starch. Enfamil®’s A.R. formula does not stand for “acid reflux” (although the company may like you to think it does!). It actually stands for “added rice”. There is no good research to show that this thickening technique actually reduces painful reflux. The downside to choosing such a formula is that a fair proportion of the carbohydrate source of this formula will now come from rice starch, as opposed to lactose. Also the protein source on spit-up formulas usually has less whey than other formulas. This must be weighed against the potential benefit of reduced spit up. There are positioning techniques for holding baby during and after feeding that are more likely to help with reflux than switching to a thickened specialty formulas. However, I know that if your little angel is truly suffering from painful reflux, you will try anything! And you should. I simply want you to know what you are purchasing so you know if it works. For example, if your little girls still has reflux on a new thickened formula, but it is happening long after she finishes eating (say 30 minutes), it is likely that the thickener is not helping because most of the contents of her stomach will have long emptied by then. The more you know, the more quickly you will be able to solve her problem. Another tactic that is used by baby formula manufacturers to prevent spit-up is to use 100% whey protein. This is because (as discussed previously), whey protein empties little stomachs faster than casein protein. The faster formula is moved out of the stomach, the less likely it is to come back up. I have no problem with 100% whey protein formulas and if they help reduce your baby’s spit up volume, all the better! The most common tactic marketed as “sensitive” or “easy to digest” is using a partially or extensively hydrolyzed protein. These formulas are marketed as helping to reduce all manner of fussiness. The thinking is that more digestible (aka: smaller) proteins will reduce general infant indigestion and gas, which will improve disposition. That is also why some companies refer to hydrolysate as “comfort” proteins. While this logic makes perfect sense, these claims are a stretch from a scientific standpoint. While this may help a few infants, there are a million reasons why your baby may be fussy at any given time, and there is no good research to support that hydrolysate protein will diminish gas or fussiness for everyone. The second common tactic used for “Sensitive” formulas is actually a lactose-reduced formula. The thinking here is: if your baby is having a hard time digesting the large amounts of lactose in most formulas, then “lightening the load” will help them out. I’ve got a happy hour about this that goes into way more detail. This marketing suffers from the same problem as the partially hydrolyzed formulas… Not all fussiness results from too much lactose! So, it may help one baby but make no difference for another. Similar claims are made regarding probiotics using the same line or reasoning – improving ease of digestion will decrease discomfort. The difference here is that there is a bit of research that makes a great argument for one specific strain of healthy probiotic bacteria as an aid for colic. There are some pretty convincing studies that show that providing L. Reuteri to colicky babies results in less crying bouts and less total minutes of crying compared to either a placebo or gas drops (1) (2) (3). Hey now! If anyone reading this has ever had a truly colicky baby, we all agree that we have tried some much crazier things to get that baby to calm down (cue endless hours of swinging baby in the carseat, running the dryer with nothing in it, or walking up and down the stairs… yes, I’ve done all those!). Gerber makes an infant L. Reuteri supplement that is pretty cheap, and ready for the correct dosages for babies. L. Reuteri is also the probiotic in Gerber Good Start Soothe baby formula. For more info about probiotics and how to add one to your baby’s diet, check out this article. If we truly knew how to cure fussiness and colic, there would be a lot fewer sleep-deprived Mamas and Papas out there! Don’t get me wrong – I actually approve of probiotics and hydrolysate proteins in infant formula, I simply do not want parents to have false hopes about what these ingredients will do. My job is to educate you so if you switch from an intact-protein to a hydrolysate protein baby formula, or to a formula with probiotics in it, you KNOW what the difference in the new formula is, so you will be more likely to quickly observe whether your baby is more comfortable consuming that baby formula. 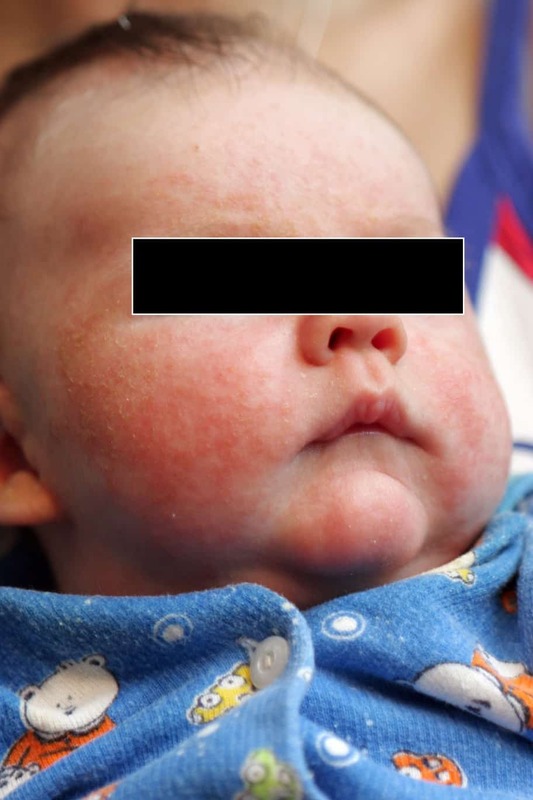 Formulas that contain partially or extensively hydrolyzed protein often claim that their formula will help prevent atopic disease on your little one’s skin. This claim is actually legitimate! How refreshing! There is good research out there to support the benefits of hydrolyzed formula (4-6) and I highly recommend choosing one if eczema is an issue for your angel. If your infant has a family history of allergies (especially food allergies) or any other autoimmune disease, such as celiac disease or type 1 diabetes, then he may also benefit from a hydrolyzed protein. 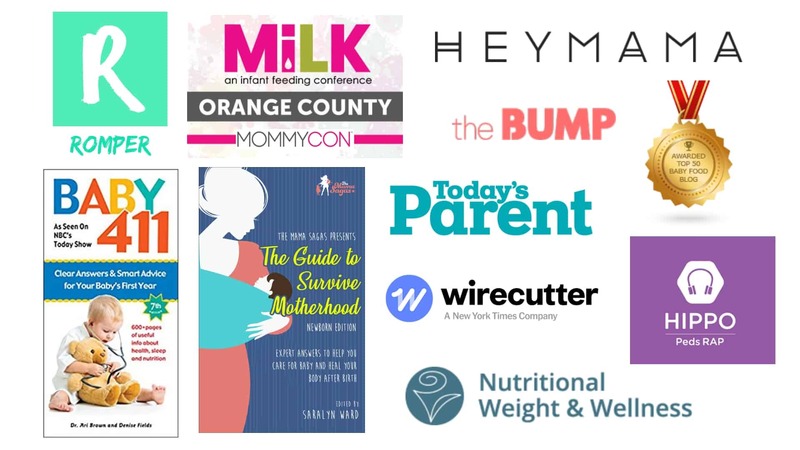 The baby formula industry doesn’t advertise these claims very much because the research suggests that babies will only benefit if they are at high-risk to develop such diseases. However, the scientific research is pretty supportive, especially for food allergy and diabetes (4-8). All babies spit up, have gas, cry, and are occasionally fussy. Breastfed babies too! It’s possible a specialty formula may help. However it most likely won’t be a magic cure-all. It is much better to know what type of specialty ingredients may be beneficial for your individual baby and then chose a baby formula accordingly. Remember, YOU are the expert on YOUR baby! Now you are armed with the knowledge to choose or switch baby formulas with confidence. Formula for spit up and/or reflux is usually thickened with starch (a kind of carbohydrate). Another approach is to use 100% whey which empties the stomach faster than casein. Both probiotics and hydrolyzed protein formulas may be marketed for gas, fussiness, or colic. This is because manufacturers hope these ingredients will diminish indigestion, thereby improving baby’s disposition. The research to support this is practically non-existent. I do approve of both of these ingredients, but would never tell parents these would cure colic. There actually is great research to support baby formula made with hydrolysate proteins for infants at-risk for atopic disease and auto-immune disease (like Type 1 Diabetes).